I was born in Conway County, Arkansaw, in the year 1852 and crossed the plains in 1857. The following are the few things that I remember. We were 6 months from the Cherokee Nation to Sacramento. We first started from Little Rock, but when we got to the Cherokee Nation we had to wait there until more people came. So few wagons were not allowed to start across on account of the Indians. Our train was a very large one, about 75 wagons, and rather a large band of cattle. The wagons were called Prairie Schooners. Sometimes whole trains would be wiped out of existence and others, part of the people would be taken captive. Sometimes a captive would get away, but not very often. We had plenty of horses; the scouts had always to be on horseback. Sometimes a small band of Indians would follow the train for days trying to get a chance to steal some of the cattle or horses. They wanted the horses worse than anything else, but the Captain always kept a guard night and day. I don't remember what the Captain's name was; the Lieutenant was Marion Inglebright. We had a guide; seems to me his name was Carson. We had been across the plains several times. We came the Northern Route and through the Rocky Mountains by what was then known as the Lublets Cutoff. When we started down the mountain, there were some places that they had to let the wagons down with ropes. Of course, everybody had to walk down those places. I know how scared the children were - afraid the Indians were sneaking around to steal some of them - but the Captain always kept the scouts on the watch. When we came near the crossing of the Arkansaw River, we had to go into camp on account of the buffalo. They were crossing, going from one feeding ground to another. There were thousands of them, it seemed like. Had to make a coral of our wagons and put our cattle inside to keep them from running away with them. A coral is made by putting the tongue of one wagon under the hind part of another one. And then, moved up close together, that makes a stout coral. We had to camp there part of two days and one night. A band of buffalo will never turn aside for anything; will walk right over anything in their way. The men rode in among them and worked out some young ones for beef. They caught a calf and brought it in camp and tied it to father's wagon wheel. The mother cow and several others charged the camp. The men on horseback had to fight them to keep them from getting among the women and children. I remember myself and two brothers and sister went under the wagon as quick as we could. Did not have time to get in it! The calf kept bleating. It was a lively time for a while, but the men finally got the best of it. We never had a fight with the Indians; we came very near it more than a dozen times. Sometimes the Captain would let a few Indians come in camp. It seems to me like the first time we had to get ready to fight was when Father hit one on the head with the handle of the ox whip. The Indian kept trying to sneak in the wagon to steal something, so father hit him. All the Indians then left camp. The Captain was mad at father for hitting the Indian. Said now that would bring on a fight, so we had to get ready to finght. It was not long before the Indians surrounded the camp. We had to stay there most all of one day and one night. The next morning they had all left; our train was most too large for them to attack. When we had to get ready to fight, the men would coral the cattle and put the women and children down in the wagon beds, so they would be free to fight. The children were certainly scared. It seemed like there were Indians everywhere. The scouts had to be on the lookout all the time. One time the guide came running back and told the Captain to hurry and get ready to fight, he had seen one of the scouts coming just as hard as he could ride. (The scout was farther away from the train than the guide). Almost as soon as the scout got to camp, we were ready to fight. The Indians had wounded him; he was so bad hurt that ll he could say was, "Indians"! But he had grit enough to hang on to his horse so he got into camp. I don't remember whether he died or not. The children were scared nearly to death. The Indians did not stay long that time. Our train was such a big one that they were afraid to fight when we were ready for them. If they could have caught us off our guard, it would have been bad for us. The Indians had bows and arrows and a few guns. Our people had plenty of guns, but they were all muzzle loaders. No other kind, those days. I remember crossing the desert. It seemed like we had been traveling a long time when we got to it. We camped several days before we started across, to let our cattle get rested, then we started in the evening. Traveled all night and until in the afternoon the next day. Where we came off the desert was a large spring and some men selling the water. Some of the people were out of money and the men would not let them have any of the water, so the Captain ordered our men to take possession and let every one have all the water they wanted, cattle, horses, and all. Almost had a fight there, that time! I don't understand how those men lived by that spring and the Indians not bother them. It was there that a few of our people paid fifty dollars for 50 lbs. Of flour! My Father had a big dog that he traded off for bacon. Out of one of the big plains, we came by an awful big rock all by itself - no other one in miles of it. Us children thought it must have dropped down from the skies. There were dates carved on it when other trains had passed by. Some of them never got through at all. I suppose they carved the date of our train, too. We passed lots of places where whole trains had been wiped out of existence. Lots of times they would carry some of the people off and keep them in captivity. There would be pieces of wagons and bones that the coyotes had gnawed the flesh off of them. The Captain would always have such things buried. Some of our people got without anything to eat and their cattled all died, but those that did have things had to help those that had none. We had very hard times the last end of the journey, but we finally landed at Sacramento, where the people scattered in every direction. I suppose they all had the gold fever! My father and family went to a little mining town called Texas Springs in Amadore County. There us children saw our first Chinaman. Could not think what kind of person it could be with a tail hanging down his back! We would run and hide from them for a while. From Texas Springs we went to a town called Millville. That is near Redding, not so very far from Mount Lassen. I have been all around Shasta Butte and Mount Lassen. We left Millville when I was 12 years old and came to Booneville in Anderson Valley. Stayed there about one year, then came over on the coast to Point Arena. I was married in 1869; went to Oregon; stayed there 3 years, then cam back to Point Arena. I am writing this in August, 1914. These words in italics above were delivered to me by Francis Jackson, a life-long resident of Mendocino and the Great Grand-nephew of Mary Elizabeth Jackson. It's fascinating and a most deliberate realization now that Francis, a very very good friend of my parents during our life in the town of Mendocino, loved looking up history during the 1950-1960's. He wrote several books written about the timber industry and the local bookstore in Mendocino sells his books even now. Our paths are destined for some kind of meaning...and it is a funny story, that my husband Larry (Mary Elizabeth Jackson Brayton is his Great Grandmother) is a relative to the said Jackson family of the Mendocino area. The synchronicity of this story can go decades...destined for Larry and me to marry. I didn't know him before I met him in college in Sacramento. It wasn't until our wedding guest lists were shared by each of our mothers, that the connection came to our attention. Throughout the years, the family history of Mary was shared..and her life was remarkable. Mary Elizabeth Jackson is the 3rd Great Grandmother of my grand daughters and is worthy of writing about her and the lifestyle that the women during this era lived. She really was a pioneer girl. She walked across the Oregon trail with her family at the age of five in a wagon train. She was very likely half-Cherokee, because she indicates in the writing above that her journey starts from the Cherokee nation. These stories of the generations are passed on through the generations also say that her mother, Jane was full Cherokee. As we hear these stories, we assimilate that information into our unconscious brain somewhere, forget about them, only to remember them decades later. I'm happy to be able to write about her. Mary's father, Joseph E. Jackson and Jane Watkins (or Wadkins) married back in the Tennessee area and left that area in 1857. As an adult, Mary settled by marrying a man by the name of Clarence Brayton, and made her life well in the Point Arena area. Life on the Northern California coast was full and required a strong will to exist. The area was thriving during the gold rush and the timber industry was booming for many, many decades. 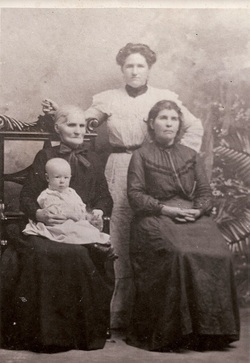 The Braytons and the Jacksons thrived along the coast all the way to Coos Bay, Oregon, living and thriving during the 1860's through the 1900's. It will be fun to create her character, as all I have is the essay from above, handed to me by Francis Jackson, her great grand nephew.